The 11 Best Yeti Coolers, Portable Bags and Buckets for the Best Summer Ever! If you’re just as obsessed as we are over Yeti coolers then read on! 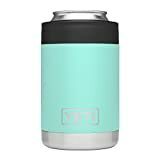 If you’re looking for a killer cooler this season (whether you’re camping, heading to the beach, tailgating, or just spending some time outside) and don’t want to settle, you gotta go Yeti. 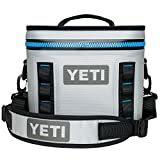 These are some of the most durable coolers we’ve seen in a while and they keep your drinks so cold for what seems like forever. If you’ve ever had anything Yeti you know exactly what we’re talking about. They’re no joke. They’re even typically named one-of-the-best by CNET! If you’re new to all things Yeti, read on for some helpful info that will let you know which of their coolers is right for you. We’ve selected some standard coolers (from small to large) a couple of soft portable bags (for those shorter trips or days away), and even a bucket cooler because, well, it’s so multi-functional. 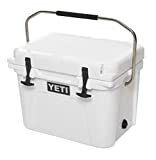 One of the most common questions people seem to have is “Where can I find a Yeti cooler for cheap?” That’s really a tough one because, overall, they’re all a bit on the expensive side. Personally, we think they’re worth it because you’ll have it forever, but that’s just us. They typically don’t have massive sales (which seems insane), but we’ve added in some coolers where you can actually save a little money. Please note, these were the discounts at the time this article was created. Get ready for you ultimate BBQ, the best camping trip ever, or just day at the park! 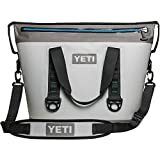 Check out some of the best Yeti coolers (so far) in 2019. This is the ‘original’ Yeti cooler where it all started! 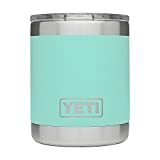 Not only is it large enough to hold all your food and drinks, it’s bear-resistant (for real), it has a cold-lock where actually blocks out the eat and keeps in the cold, and it comes in ice blue, desert tan, and classic white. The Tundra 65 is 30.5-inches long by 17 3/8 inches wide and 16 inches high. Without anything in it the Tundra weighs in at 27 pounds. That’s not the worst, but when you do fill it up you made need a friend help you carry it. That’s what friends are for, right? At the time this article was written you can save 13% off the price and enjoy free shipping with Prime. 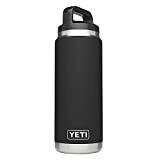 This one is one of our favorite soft coolers (even outside of the Yeti family). After you add some ice you should be able to hold up to 16 cans of your favorite beer, soda, or seltzer water (but, who are we kidding, it’ll be 16 beers). This makes it perfect to take out with you to the park, on the boat, or just to that BBQ you’ve been dragged to. This one is 100% leakproof, waterproof, and is resistant to gross mildew. Plus, it’s pretty light. Before you add anything to it, it weights in at right around 5-pounds. Toss it over your shoulder and off you go. It also comes in a wide variety of color options like grey and blue (pictured above), tan, and desert tan and orange combo. The Tundra 35 is on the smaller side (not the smallest, but still), but can still keep around 20 cans of your favorite drinks cold. You should be able to carry this one yourself but, as always, it’s much easier to carry with two people. Also, due to the PermaFrost insulation, the ice you add is actually going to say ice for way longer. This means after a while your drinks won’t be floating in a pool of just cold water. Without anything in it, this one weighs in at around 15 pounds. Check it out in desert tan, white, or ice blue. At the time this article was written you can save 17% off the price and enjoy free shipping with Prime. This is one of our favorite Yeti’s this season. It’s a hybrid of part cooler and part backpack, making it super easy (and pretty comfortable) to carry around all your drinks and whatnot. Speaking of which, you should be able to easily carry and store around 20 cans of your favorite beverages (with a 2:1 ice ratio) and keep them cold for the day. The outside shell is waterproof, puncture proof, and UV proof. What’s better than that?! This is the perfect cooler for camping trips, spending the day at the beach, and other adventures you’ll be on this season. 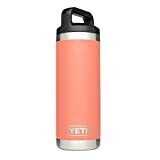 Looking for a Yeti that’s pretty small and easy to carry if you’re just heading out for the day to a small get-together? This is probably your best best. You’ll be able to haul around 14 cans and still have plenty of room for ice. Without anything in it, it weighs around 16 pounds, but the durable handle with grip makes it pretty easy to cart around with you. We love this one for when we’re tailgating or heading to a friends party outside in the whenever. We got to be honest, we love a bucket as a cooler. Sure you can store up to 52 cans (yes!) of beer in the Yeti Tank 45 (why didn’t they just call it the ’52’), but you can also easily fit a small quarter keg right in there too. The DoubleHaul handles makes it easy to carry yourself or with a friend (even easier) and it also comes with a drain system which removes all your leftover liquid quickly and easily. Without anything in it, it weighs in around 13 pounds. As usual, it comes in classic white, ice blue, or desert tan. 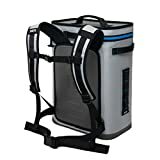 If you’re heading out on an adventure (hello camping, hiking, or kayaking) this is the durable soft portable cooler for you. It’s totally leakproof and the fabric is waterproof and mildew resistant. Yeti used Hydrolok when making this, which they utilized from hazmat suits and survival suits so yo know they’re not messing around. We already mentioned the Tundra 45 model, but we just had to add this one to the list too because we’re obsessed with the new color, Reef Blue! It’s time to stand out from the crowd! 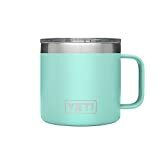 Keep your water cold or your coffee nice and hot the entire time! This one keeps your drinks cold or hot, plus the mag-slider lock is pretty great because it’ll help keep your beverage from spilling out! Who’s ready for the coffee of their dreams! 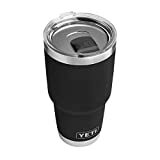 This one is perfect for when you’re camping because it’s double-wall vacuum insulation will keep your coffee nice and warm from a really long time. Oh, and if you’re sneaking some beers in this guy, well, it’ll keep it cold too! We like how the handle is extra wide so most people can fit their hand right through and around the mug. Outside of how tough and awesome this mug is, we also like that it’s dishwasher safe because we’re not known for washing things in the sink, like, ever.